I'm a curriculum junkie! Thanks so much for blogging about this company. I hadn't heard of them before. I would LOVE to win a full year!! I like that they include so much on the CDs, so I can customize our studies. I also like that they schedule it so nothing is repeated throughout the preschool years. Looks like a great program! This looks like a great curriculum! I know my niece would love it. I like the fact that it does not repeat itself, like I would expect some companies to normally do. I would like the preschool bo curriculum. Thanks! I love that it's on CD. And I love that it says I can focus on my kid. I'm not that well organized, so I really need someone to organize things for me. I love that it is about the bible! I love that there are poems in the curriculum. That's a great addition! i love that they also carry a set of bible stories too! AND..the curriculum makes them gain self confidence! I love that it's a preschool curriculum based on literature. As a bookworm myself, I'm all over anything that encourages a child to read all the while teaching them the enjoy it and learn in the process it. I like that it has lots of games and is something he can keep with for a whole year. He also really likes using the laptop so he will be inspired to be a better listener. Thanks! Their curriculum looks awesome! I love that they have bible story units and that it's on CD!! We've got a 2 year old and a 4 year old with special needs, so we do a lot of extra work at home with her to try and help her prepare for kindergarten. This would be a big help!! I'd love to check this out. Thanks for a great giveaway. I love the focus on books and literature! My daughter is crazy crazy about books. I also like the fact that it starts out with the itty bitty little babies (18 months) instead of 2 or 3 year olds! I like the fact that the curriculum will increase self confidence. That is very important to learn properly, and just what my daughter needs. I also like the fact that there are bible stories included. A love for books is so important in so many areas of life. Thanks so much for introducing me to this wonderful company. I like that this is designed by early education specialists. I like the focus on books and the choice of books! 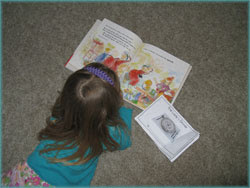 I homeschool my kids & I love that there are so many learning activities for my preschooler. I also like that it's Bible based. I would use the Bo curriculum. The fact that they have games and the like incorporated means little minds won't get bored. Thanks for the giveaway! I like that its Bible based and appropriate for my 2 1/2 year old now! I like the Bible Based curriculum! This would be fantastic for my 2.5 yo! Thanks so much for such great info!